You are a mad scientist of macaroni and cheese, make you own creation! 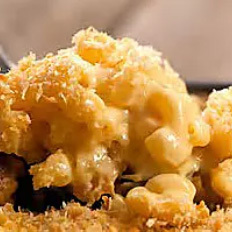 Or get it as “Just Mac.” Meats: +$3.50 ea. Pulled Chicken, Shrimp or Chili. Veggies: +$1.00 ea. Tomatoes, red onions, scallions, mushrooms, roasted jalapenos, artichokes, roasted red peppers, sautéed onions or caramelized onions.